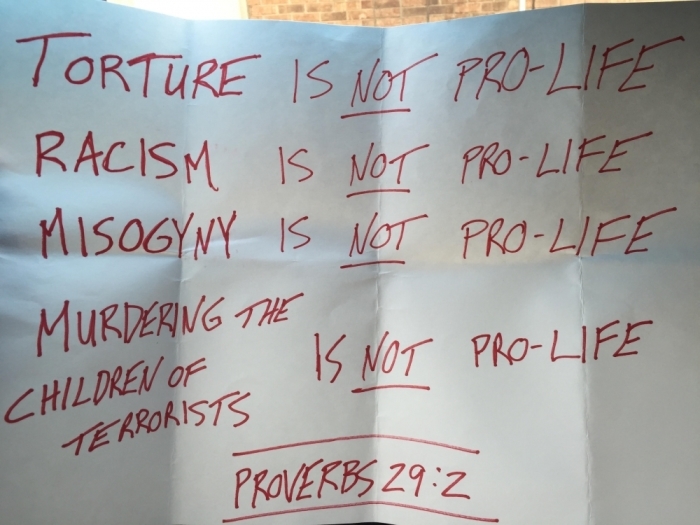 Outside Donald Trump's meeting with evangelical leaders stood a dissenting conservative evangelical political activist, Eric Teetsel, who had a message for the attendees: Torture, misogyny, racism, and murdering children of terrorists are not pro-life. Teetsel wrote this message in red ink on a posterboard he bought at at nearby Staples and underneath his statement included "Proverbs 29:2," which reads, "When the righteous thrive, the people rejoice; when the wicked rule, the people groan." Teetsel, 32, is former director of the Manhattan Declaration and former faith advisor to Florida Sen. Marco Rubio's presidential campaign. According to Yahoo News, Teetsel told reporter Jon Ward that it is important for Christians to pray for Trump but also to be "a prophetic witness about what is true." In an exclusive interview with The Christian Post, Teetsel said that although he was not invited to the meeting, he happened to be in New York on other business and sensed the Lord prompting him to do something. "It takes practice to become aware of those moments when it's time to do something crazy for God, and even more practice to actually respond. Whether it's sharing the Gospel with a stranger on an airplane or holding a sign on the streets of New York, it isn't easy to put faith into action," Teetsel said. "I felt like a few one-on-one conversations [with attendee friends] wasn't enough," he continued, "the Trump campaign did this event in order to get the media to write that Christians are supporting him. I wanted to do something to make it clear that there is more to the story. So I made a sign." 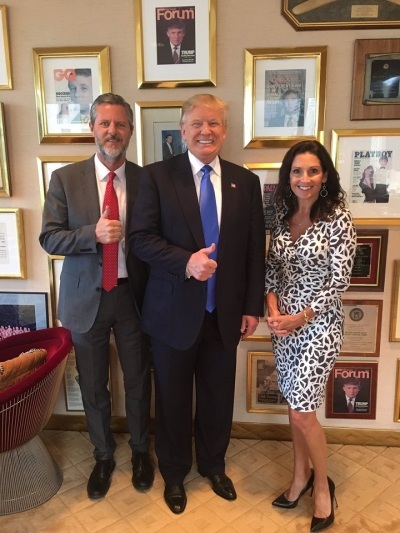 To the surprise of some, Donald Trump received notable endorsements from evangelical figures like Jerry Falwell Jr. during the Republican primary. Since Trump's victory, several other leaders who had endorsed other candidates appear to be warming up to the idea of a Trump presidency, leading to this much publicized meeting. CP asked Teetsel if he thought that in the event Trump is elected president, if there is any indication that he would be an ally of evangelicals and social conservatives. Only when it serves his interests, he responded, noting that Trump is quite the opportunist. "He will use us when it benefits him to do so, and dump us when it doesn't," Teetsel said, adding that at this moment in history when foundational principles are being destroyed, like the nature of male and female and the rights of citizens to live according to their beliefs, "it is foolishness to hope for a bulwark in the form of a serial adulterer who once instructed his lover to abort their child." And what about an alternative, third-party candidate? Is a competitive one feasible? Absolutely, Teetsel answered. "Hillary Clinton and Donald Trump are the least popular nominees in modern American history, and a majority of Americans want a third option." Teetsel also told Yahoo News that one of the things he realized in this election cycle was that relatively few believers in Jesus live by a biblical worldview and contends that Christians have done an awful job instructing disciples how to live their faith. What should pastors and Christian leaders do about that, CP asked. "Americans have allowed the Gospel to be understood as nothing more than a sort of philosophy of life and emotional salve. Well, you can get that from Oprah or Rush Limbaugh. That's not the Gospel. Jesus is not a Democrat or a Republican. He is a monarchist. Jesus is a King who invites His people into an abundant, adventurous life, filled with joy and many trials," Teetsel said. "Let's get back to telling that story," he concluded.